Here’s an entertaining video if you have a spare hour this bank holiday. George Galloway’s Respect Party is not – as they undertook to do so 18 months ago – fielding any candidates in Croydon’s local elections next month. The absence of candidates from minor parties may be seen by some as evidence of how the state-funding of the borough duopoly between the Conservatives and Labour parties manages to exclude alternative political views. In Croydon, the borough’s 70 councillors between them receive £1.4 million a year in “allowances” out of our Council Tax, of which a hefty whack is used to subsidise those parties’ activities. Other political parties are excluded from such public funds, creating an obvious disadvantage. “Three cheeks of the same arse,” is the way that Galloway is fond of describing the Tories, Labour and LibDems within Britain’s political Establishment. 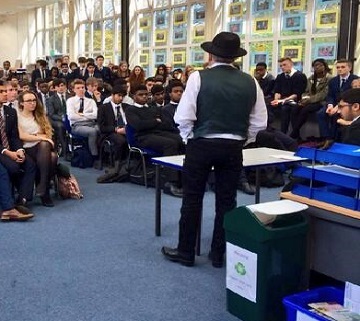 We will be posting another politics society session from Wallington County Grammar School, and one of especial local interest to Croydon voters, tomorrow. This entry was posted in 2014 council elections, Education, Outside Croydon, Schools, Sutton Council and tagged Conservative, Croydon, George Galloway, Labour, Lee Jasper, Liberal Democrats, Respect, Sutton, Tory, UKIP, Wallington, Wallington County Grammar School, WCGS. Bookmark the permalink.